This Retrofit / upgrade for dimming systems, brings dimmers repair & lighting control maintenance costs down to nothing by converting old Dimming systems to new digital lighting control systems for a small fraction of a new replacement cost. The most costly of the two sections is the POWER Dimmer section (2). In most cases, it is not the source of the problems. Even the new dimmers' POWER sections are built based on the same technology developed in the early seventies therefore nothing is improved by replacing most of them. 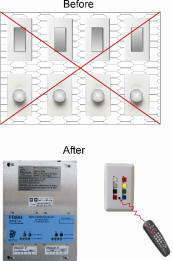 What only needs upgrading / retrofitting in existing dimming systems is the LOGIC lighting control section (1). The PROTOCOL allows to inexpensively Retrofit, upgrade or repair existing dimming systems made by other manufacturers. It is done by connecting the PROTOCOL logic modules MD400 ( firing card for 4 dimmers ) & control stations PSFxx to the existing dimmer modules. The installation does not require any costly work on the Line Voltage side & utilizes the existing control wiring. Besides providing a reliable and fully featured dimming system, this type of UPGRADE / RETROFIT saves a lot of money and reduces to nothing any future dimming system's maintenance needs and costs. 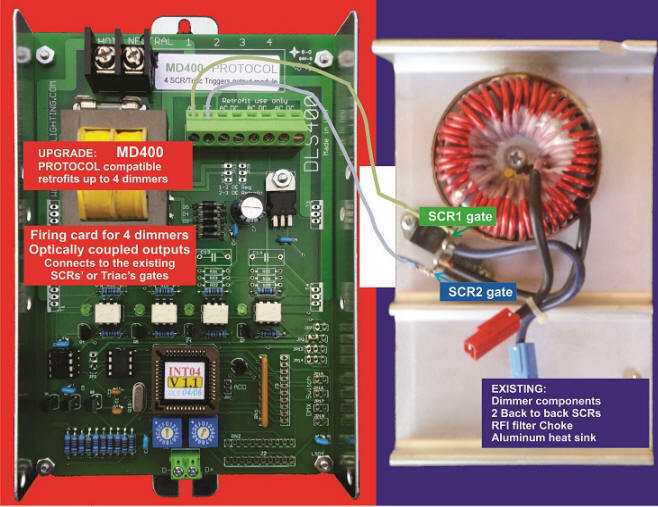 By replacing problematic lighting controllers with the new PROTOCOL front end components using existing wiring this retrofit rebuild solution adds features, flexibility and years of reliable performance to an otherwise condemned dimming system. The upgrade results in a digital dimming system that could interface seamlessly with Audio Visual and other control equipments, with features like 254 scenes and multi way controls, Universal infrared compatibility along with the capability of combining controls for Multi Room applications via the PTAxx patch panels room combiners. Whether you do Dimming Systems repair, service and maintenance or you own an old dimming system ,just E-mail Us or call us to perform a free feasibility study. Some venues' elaborate lighting and interior design are diminished because they do have a cluster of wall dimmers and switches with which it is not possible to create the appropriate different lighting scenes or to control the lights from multiple locations. These individual wall dimmers and switches can be quickly and inexpensively replaced with the PD dimmers while using the existing wiring. Then it would be easy to add control stations PSFxx in any location for individual or preset scene control locally or with infrared remote. Retrofitting with the PROTOCOL dimming system proves to be an easy, practical and affordable tool to improve the ambiance and achieve the right moods intended by a well planned lighting design. Call us with the number of switches and dimmers and we will give you a quick quote. You will be surprised how economical and simple it is to have a working dimming system. 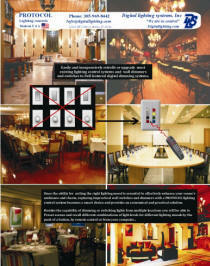 Single state wall dimmers and switches can be easily replaced with a multi scene multi way controlled dimmers. Lighting control repair & upgrade is now easy and inexpensive, do not dump these dimmer cabinets we can refurbish and upgrade them. Prescolite entered into an agreement with digital lighting systems, inc. back in 1997 to upgrade their old Analog dimmers to Digital full featured systems. Since Prescolite closed down their dimming manufacturing department in 2000, Digital Lighting continued to provide service and maintenance parts for the hundreds of Digital dimming systems sold by Prescolite. Also we provide easy and inexpensive upgrade and retrofit for old analog prescolite dimming cabinets and systems. Vantage Controls introduced itself into the dimming controls market by launching its first system, the LiteComp 1000/2000/3000 dimming controllers. Digital Lighting Systems was the original equipment manufacturer and designer of the LiteComp CPU and controls for VANTAGE controls from 1987 till 1990. Hundreds of LiteComp systems have been installed and are still in operation today. Digital Lighting Systems has received numerous calls from LiteComp system owners seeking service and maintenance for these systems. In most instances, we were able to help repair the LiteComp systems. However, because that particular technology dates from 1986, certain components and parts are no longer available. call us for dimmers repairs, dimmers upgrade, dimmers retrofit and dimming systems general service and maintenance alternatives.